Snow on canola standing for straight combining. What to do? 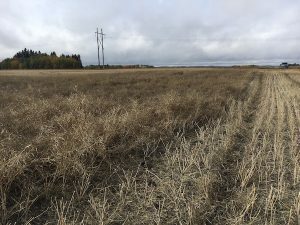 Frost that comes with snow can actually help desiccate a fully-mature canola crop and any weed patches present, helping to prep canola for straight combining. But frozen pods may show a greater tendency to shatter, especially if the variety is not shatter tolerant, so be prepared to straight combine on short notice to limit shattering losses. Standing canola that was flattened by a recent snowfall. Heavy snow can also flatten standing crop. Stems broken off by snow could mean plants could move and bunch up in the wind, but this may be minimal if the plants are knitted together. Should you swath? If (and only if) frost hits before a standing crop is fully matured, swathing may give the crop time to cure and rescue more yield in the process. But if crop is mature and will be ready to harvest as soon as it dries, swathing is not recommended. This will not be an easy crop to swath, potentially resulting in a poorly laid down windrow. The material will also be light and fluffy making it very prone to blowing. These flattened crops won’t be easy to straight combine either, but adding in another operation could only amplify the frustration.